Being a (fake) nun doesn’t preclude you from menstrual cramps or smoking cannabis to deal with cramps. 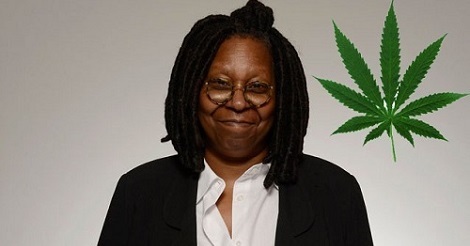 Anyone who has seen Sister Act 1, 2, or 3 (yes, there is a third), knows that Whoopi Goldberg loves marijuana. If after seeing a movie about naughty nuns doesn’t convince you, then maybe Goldberg’s new line of medical marijuana products meant to alleviate menstrual cramps will do the trick. In fact, Goldberg has been outspoken about her medical-marijuana love saying she uses her kush-filled vape pen to alleviate glaucoma-related headaches. After acknowledging the positive affects of smoking for her headaches, she thought of applying the same technique for menstrual aches. After Goldberg found out from industry experts that there wasn’t anything on the medical marijuana market for cramps because it was a “niche” market, she got together with “canna-businesswoman” Maya Elisabeth from Om Edibles and made it happen. One of the many benefits of alleviating pain and discomfort with the “Maya & Whoopi” product line is that the ingredients are far less complex and chemical based than normal pain relief medication. The new line will also include products with CBD for those who want to relieve pain but stay a bit more grounded. This is actually a pretty amazing opportunity for half of the earth’s population who feels any level of discomfort during “that time of the month.” For the other half of the earth’s population (you know who you are), this could also provide some relief. If the effects of PMS could be exchanged for the effects of THC, everyone would benefit. However, due to all kinds of silly regulations, as of April 2016, the product line will only be available in California. Let’s hope for everyone’s sake that Whoopi can spread the love for all (wo)mankind. Have you tried cannabis for cramps? Let us know on social media or in the comments below.